Taking place from April 24 to 26 in Halls 17 & 18 at the NEC in Birmingham, the Sign & Digital UK team has committed to significantly increasing the feature and content areas at the 2018 show to help visitors increase their knowledge and learn new skills. In addition to product launches and exclusive show offers, this year’s event will offer three new live interactive demonstration zones, a full programme in the new mainstage theatre of panel debates, SDexplains seminar sessions and expert speakers, as well as the return of the popular Signmakers’ Workshop and training workshops from Adobe and Corel. Three brand new demonstration zones have been created – Décor Live in partnership with Antalis, Vehicle Wrapping Live in partnership with Spandex and Textile Printing Live in partnership with Hybrid Services/Mimaki. Visitors will not only be able to have a go but will also learn how they can add these areas to their businesses as additional revenue streams. In keeping with this year’s theme – Creativity brought to life – the main stage theatre will double-up as a TV studio, capturing content and also using the studio as a base to film the many demos, workshops and exhibition stands across the show floor. This year’s live talk schedule will be head lined by retail expert and broadcaster, Mary Portas. Speaking at 2pm on April 24 in the main stage theatre Mary will offer advice to SME business leaders who are looking to explore ways of getting ahead of their competitors. The recently launched Sign & Digital explains initiative will be brought to life in a series of practical sessions hosted by independent industry consultant Colin Gillman. In the ‘Surface Décor’ session on April 24, Colin along with invited guests will show visitors how to produce eye-catching, interior enhancing products that can transform a room, business space, or retail environment. Other sessions include ‘Promotional Printing’, ‘Digital Printing on Textiles’ ‘Vehicle Wrapping’ and ‘Getting into Wide-Format’. Another new initiative from the show organisers is the introduction of three Industry Panel Debates to discuss current and future industry topics. April 24’s debate is headlined ‘’Bringing the modern workspace to life’’ and leading names from the interiors and workspace design arena, will look at the ways inspirational graphics, printed textiles, signage and even wayfinding can bring the modern workplace to life. On April 25, senior experts from Spandex, Hybrid Services/Mimaki, the BPIF -British Printing Industries Federation, Allen Signs, Signs Express and Epson will form a panel debating the future for the market. The panel will be chaired by Gareth Ward, editor of Print Business, and the discussion will touch on the next big thing, whether price will be even more of an issue or will customer service win in the future and where wide format is headed next. April 26’s debate, chaired by David Catanach, director of the British Sign and Graphics Association, is headlined ‘Running a successful business in the Sign & Graphics market’ and the panel will comprise senior executives from Signbox, Hexis, Blackman & White, Signarama and DMA Signs. Topics to be debated include whether creativity is key to offering client solutions, and what the priorities are to keep your business at the cutting edge. 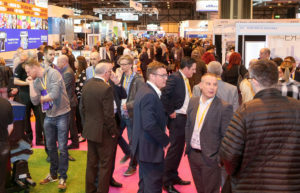 Rudi Blackett event director of Sign & Digital UK said: “Over the last three decades Sign & Digital UK has evolved into the annual flagship business event for everyone in the sign and display industries. “It’s a showcase and a celebration of all that’s innovative and inspiring in our market as well as the perfect platform to source new products at the best prices. This year we are looking forward to greeting visitors from a wider spectrum of industry sectors, than ever before. We know that content is becoming increasingly important and this year we are providing visitors with even more opportunities to learn about new markets and technologies.